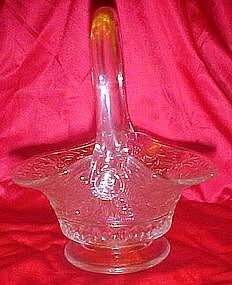 Pretty little basket made for Tiara Exclusives probably by Indiana Glass with one of the old Duncan Miller molds. An early Tiara piece. Initials on handle are DJ. This is one you see very often. Measures 6 3/4" tall and is in pristine condition. Very Sweet! !